Riot Games is teasing what appears to be a new League of Legends Champion known as The River King. On the outside, he looks like just an overgrown catfish, but he deals like the devil and he'll swallow you whole. That description doesn't come from any official source, but I like to think that it fits with the tone set in the trailer, which was transcribed by the good folks at the League of Legends Wiki. "Boy, the world's one river, and I'm its king. Ain't no place I ain't been. Ain't no place I can't go again," the River King says to the gambler. "And the price is a minuscule thing. See, I got hungers that ain't easily fed. But those finest tables? They ain't never got a seat for me. So I need men, like yourself, to let me in." I don't want to spoil anything for you, but I will say that this story doesn't take place in Georgia, and this gambler doesn't appear to be the best there's ever been. 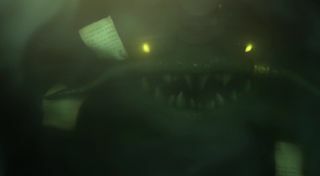 The Wiki contains a few other details as well, which may or may not be important: A Rift Scutler turns up, the River King has the same accent as Twisted Fate, and Twisted Fate may in fact be the gambler in question, a theory that's also come up in the LoL Reddit. The River King also appears to be wearing a hat, although the image is hazy and it could be... well, I really don't know. I'm sure we'll find out soon enough, and we'll let you know when we do. Until then, speculation ahoy!